My husband and I love the Santa Barbara area, especially Montecito. So much so that we almost bought a house there a few years back. While that didn’t happen, we still try to get there for a little escape whenever we can. And, when we do, our favorite things to do are shopping, eating, and wine tasting. This past visit, we were lucky to get restaurant recommendations from a friend who lives there. We hit most of them, so I can share which quickly became our favorite Montecito Santa Barbara restaurants. You really shouldn’t miss these gems if you visit. This lovely restaurant, a former 19th century citrus packing house, is located at San Ysidro Ranch in Monecito. I honestly can’t think of anything bad to say about it. The location is stunning, like you are in Provence or Tuscany; the food is delicious and gorgeous looking; and the staff are very friendly. Even the menu is one of the prettiest I have ever seen. But, of course, it’s the food and ambience that takes center stage and makes The Stonehouse win award after award, including “Most Romantic” in Santa Barbara. You can eat outdoors or in and either is stunning. Whenever I eat outside on the patio, however, I feel like I have truly been transported to Provence and am never in a hurry to leave. The regional cuisine is as the restaurant likes to say, “A blend of organic inspiration and culinary artistry”. Many of the dishes are replete with items from the on-site chef’s garden. I was quite pleased as they actually had a vegetarian menu. My husband savored his Parmesean Crusted Halibut and I had a delicious House-Made Fettucine with English Peas, Asparagus, Ricotta, and Carrote Nage. This was actually a repeat visit to The Storehouse and I have to say it remains simply a delightful experience all around. We instantly knew we were going to like The Lark when we pulled up. It’s in the Funk Zone section of Santa Barbara, which is filled with art galleries, wineries, restaurants, and the oldest bike shop in the US called Hazard’s Cyclesport. At night, the place really lights up and the whole area comes to life with Figuero Mountain Brewery, Les Marchands Wine Bar, Cutlers, and the Lucky Penny. 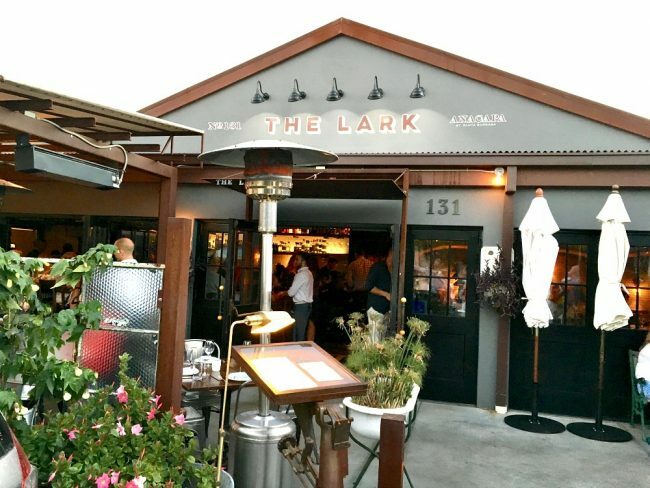 The Lark, one of the hottest restaurants in Santa Barbara, has tons of indoor and outdoor eating and drinking space. There’s also a big bar and a large communal table in the middle of it all. We were early so sat at the bar for about 15 minutes. We immediately engaged in conversations with the bartenders and the people sitting next to us. They serve you popcorn, but it’s made with bacon fat and I’m so pleased the bartender mentioned this. As a vegetarian I would have been very upset if I’d eaten it and who would think to ask if there’s meat in the popcorn! In terms of the food, I can personally vouch for the Rosemary Cornbread with Whipped Peach Butter, Grilled Peach and Heirloom Tomato Salad, Carmelized Diver Scallops, and Hand Cut Pappardelle with a variety of peas, mushrooms, and white truffle. If you’re in the area at lunch time, you’re out of luck with The Lark. But, its sister restaurant, Lucky Penny, is and you get really good wood-fired pizza, salads, and sandwiches. It’s also open for breakfast. If you like Italian and seriously, who doesn’t, then you can’t miss with Tre Lune in Monecito. You can eat outside on the little sidewalk patio or enjoy dining in this very cute, combination contemporary and take me back to the old world, restaurant, where pictures of glamorous Hollywood stars of years past line the walls. We both smiled when we walked in and knew it was going to be a good dining experience. You know why? It was a Thursday night, the place was packed, and it was packed with locals, not tourists. The waitstaff knew the patrons and many of the patrons knew each other. We were actually the odd men out, but were treated like any other patron – we were given a great table in the middle of the restaurant and our waiter was super friendly and helpful. Of course, we both ordered pasta dishes. I had an Insalata di Fagioli to start as I adore butter beans, but rarely have them. For entrees, I had the Fusilli Aristocratici with roasted artichokes, leeks, mushrooms, truffle oil, and dry ricotta. My husband had Linguine al Gambei with shrimp and zucchini in and oil olive and garlic sauce. Everything was delicious and every dish that passed by us looked worthy of ordering. Can’t tell you about dessert as we were just too full, had been traveling all day, and still on east coast time. My friend recommended Lucky’s Steakhouse to a vegetarian and said “Trust me, they have the best veggie burger.” The restaurant has multiple dining areas, including a large outside patio, an atrium when you walk in, rooms in the back, and of course, the bar. We were seated in one of the rooms in the back. We had to laugh as the walls at Lucky’s were also covered with black and white photographs of old Hollywood stars just like Tre Lune. It’s the type of restaurant that just begs you to order a Martini if you know what I mean. Even the menu reminded me of a steakhouse from the 1960’s. Of course, my husband had to have a steak and was so happy they offered a 10 oz. NY Strip. He had it with peppercorn sauce and had no complaints. Neither did I with my The Range Free Vegan Burger, which based on the name, had to confirm with the waitress that it indeed was vegetarian. Delicious sums it up. We were looking for a place to have lunch and The Honor Bar always looked busy, so we thought we’d find out why. There was going to be a wait for a table in this very small restaurant with an outside patio, but we were offered a seat at the bar. We grabbed 2 seats without hesitation. I love to sit at the bar and eat, especially for lunch. You get to chat with the bartenders and get a bird’s eye view of what’s happening in the restaurant. I ordered the Veggie Club with feta, avocado, cucumber, arugula, and pickled onion. All I can say is OMG this was good. Add to it fantastic french fries and a Margarita and I truly could not have asked for anything more. While my husband thoroughly enjoyed his Kale and Rotisserie Chicken salad, it could not compete with my lunch. It’s a small menu, but filled with tasty treats and something for everyone. They also have a little market next door that would be great to grab a coffee and/or a meal to go. I have to say it was really tough to narrow our favorite montecito santa barbara restaurants down to these few. We spent most of our trip this time in Montecito, so that’s why the concentration is so heavy in this area. If you’re craving Mexican with a Santa Barbara twist, we really liked Cava the last time we were in town. Just didn’t make it there this time. It seems to be a favorite with locals and if memory serves me well, they had really good Margaritas and chips.